Why choose pet grooming gloves? no more stressful chasing trying to comb out your pet. 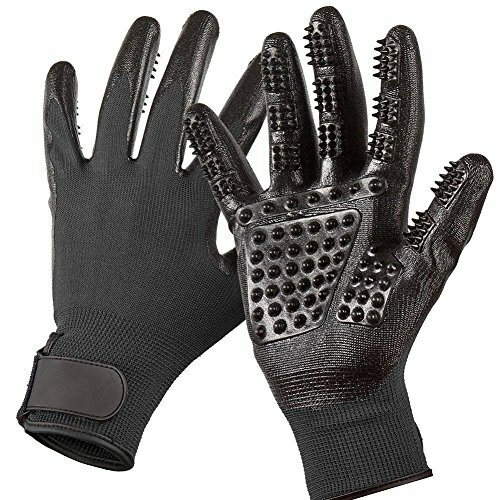 High quality Grooming Gloves were designed to be extremely gentle with your pet bringing only satisfaction and pleasure. HAIR REMOVER EASILY: Perfect for long, short and curly haired dogs, cats, horses, rabbits and other pets, grooming the hair quickly, gently and effectively, the shedding hair sticks to the glove, making it easy to peel and throw hair away. ENHANCED FIVE FINGER DESIGN: Allows you to groom hard-to-reach places like face, legs or tail, rubber tips provide gentle relaxing massage to your pets and get more time for play or outside walk. MULTIPURPOSE PET GROOMING ACCESSORIES: The soft rubber nubs of the cat grooming gloves will also gently massage your pet while you groom its fur, and they will increase the blood circulation of its skin. COMFORTABLE AND ADJUSTABLE DESIGN: Whether you're a man or a woman, these cat deshedding gloves will fit you perfectly. Dog shedding gloves are quite large and they have adjustable wrist fasteners that will provide you with the most secure and comfortable fit. WHAT YOU GET: 2 pet grooming with our worry-free 12-month warranty and friendly customer service, which make your purchase absolutely risk-free and you can enjoy testing out it's quality and durability! If you have any questions about this product by PetBoBo, contact us by completing and submitting the form below. If you are looking for a specif part number, please include it with your message.